O'Rorke hit two goals for the Dubs. DUBLIN HURLING MANAGER Mattie Kenny made a real statement of intent when he added Oisín O’Rorke, David Treacy, Danny Sutcliffe and Seán Treacy to an already-strong team for this afternoon’s clash with Offaly in Tullamore, and from the early stages is was clear that there was never going to be a repeat of last year’s league game between the two, when Offaly upset the odds at Croke Park. Some poor shooting in the opening ten minutes meant that even though they played with the wind, Dublin were deadlocked at that stage at 0-2 apiece. However a fast break from Donal Burke down the left wing ended with a lateral ball across to O’Rorke who somehow found a huge gap on the corner of the Offaly penalty area, and once the Kilmacud Crokes man picked his spot in the bottom corner of Eoghan Cahill’s goal, the Boys in Blue never looked back. Offaly’s attacking deficiencies were laid bare by Waterford last week in Thurles as they came away woisiith just 0-7 on that occasion and this was little better, as yet again their goalkeeper was their top scorer. Kevin Connolly fired over three frees but struggled from open play and was guilty of a large proportion of their 11 wides, and it was only in the first 12 minutes of the second half, when they scored five points out of their total, that they looked like they might pick up some momentum. Dublin for their part struggled in some sectors, though they weren’t helped by an early injury to Liam Rushe, but in O’Rorke and Burke they had two devastating finishers that easily brushed Offaly aside. O’Rorke’s goals may catch the headlines but Burke was in scintillating form as he split the uprights from all sorts of angles, a beacon of accuracy on an afternoon of profligacy at the midlands venue. He had four points on the board by half time when Dublin led by 1-10 to 0-5, and it could have been even worse had Eoghan Cahill not been able to save a meekly-struck penalty from Seán Moran in the 26th minute. O’Rorke earned the opportunity when he got inside Tom Spain and was dragged down by the corner back, but Moran will want to forget his effort that got bogged down in the soft ground and was easily blocked by Cahill. Offaly rallied briefly at the start of the second half but their revival was cut short when O’Rorke slipped in his second goal after 46 minutes, and from then on it was pedestrian fare as the two sides traded points right up until the closing moments, when Dublin’s greater fitness shone through. John Hetherton and Fergal Whitely came off the bench to post 0-5 between them and Hetherton in particular made a strong case for inclusion after he added both heft and craft to the Dublin attack, on a day when players like Rian McBride, Eamon Dillon and the Treacy brothers failed to make an impact. Dillon’s day was summed up when he darted through the Offaly defence in the final minute but pulled a shot on goal wide from 13 metres out, though Offaly had no more luck with their goal chance, Oisín Kelly crashing an effort off the crossbar with the last attack of the game. Scorers for Dublin: Oisín O’Rorke (2-3), Donal Burke (0-6), John Hetherton (0-3, 0-2f), David Treacy (1f) and Fergal Whitely (0-2 each), Liam Rushe, Sean Moran and Danny Sutcliffe (0-1 each). Scorers for Offaly: Eoghan Cahill and Kevin Connolly (0-3f each), Paddy Murphy (0-2), Oisín Kelly, Colm Gath, Damien Egan and Kevin Dunne (0-1 each). Email “O'Rorke on the double as Mattie Kenny's Dublin ease to 13-point win over Offaly”. 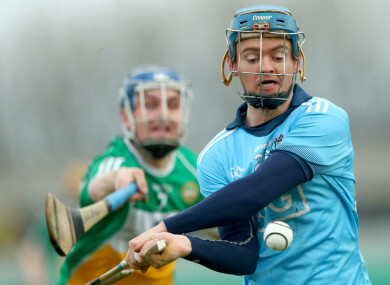 Feedback on “O'Rorke on the double as Mattie Kenny's Dublin ease to 13-point win over Offaly”.